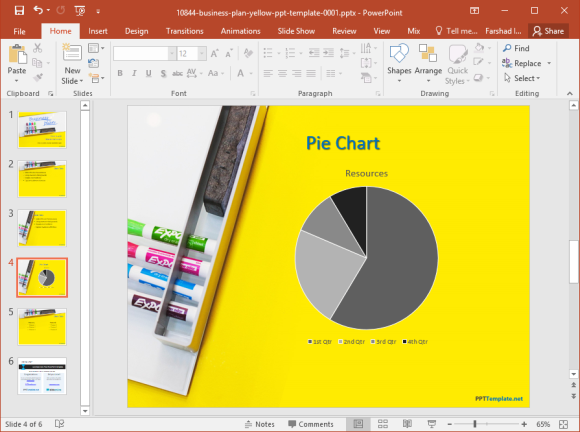 The Free Business Plan PowerPoint Template is a free slide deck which gives a simple layout for presenting your business plan. 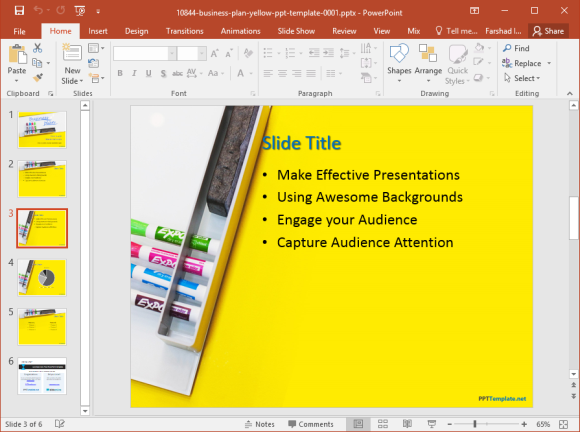 This PowerPoint template contains slides for adding an executive summary, market strategy, projected market share, pricing, promotion and distribution strategy. The layouts depicts a classroom like setting, with images of a whiteboard, markers and duster. You can use the placeholders to add your title and content to design attractive looking slides in no time. The template background is quite eye-catching, and the yellow color pops out amidst the text placeholders without being obtrusive for the viewer. The content slides are quite generic and can be modified for adding diagrams, charts, text, etc. You can use the given sample slides for designing your custom layouts, as well as use the Layouts menu to choose between a wide variety of default slide layouts such as; Section Header, Two Content, Comparison, etc. There are five sample slides for designing your deck. You can also duplicate slides to create additional slides according to need. Each slide comes with the same yellow backdrop and the image of a whiteboard with colorful markers and a duster. The whiteboard image is pivotally placed across different slides. In some cases it is located at the top, whereas other slides show this section as a sidebar. 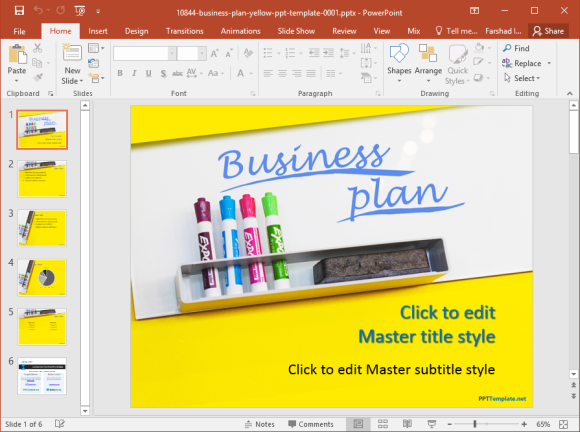 The Free Business Plan Template can be downloaded for PowerPoint 2007 and later editions, including; PowerPoint 2010, 2013 and 2016.